Guys, it’s that time of year again, and we couldn’t be more excited. Brisbane Festival is back! You know what that means: a killer line-up of shows, music, fun and festivities. And, most importantly, food — all of the food. Even though the line-up [link to our picks] this year is all kinds of amazing, we can’t help but crave a little more. We’re, of course, talking about food. There’s no shortage of places to stop and refuel as you traipse between shows or from gig to gig. Having this much fun creates quite the appetite, don’t you know? Keep reading if you’re all about combining the best food with the best events on in Brisbane, because we’ve put together the ultimate food trail for this year’s Brisbane Festival. If we’re being honest, this is probably the one we’re most excited for. It’s like your childhood fantasies of having your own tree house mixed with your adult fantasy of being able to drink in the coolest place possible. The Little Creatures Treehouse is just what it says on the tin: an uber cool tree house with a spacious, leafy deck overlooking the Brisbane River and all of the sights and sounds of Brisbane Festival serving up your favourite Little Creatures tipples. All of the beers are on tap which is the best news ever, and they're flying over a special beer you can (usually) only get at their distillery in Geelong - Shift Brewers' Stash. It's got notes of caramel, chocolate and citrus. Pourboy know a thing or two about coffee. So we couldn't be more excited that they're setting up shop at Arcadia throughout Brisbane Festival. Expect delicious coffee and cafe style bites to eat including reubens, gyros and cheese burgers. Nitrogenie’s theatrical style of food fits perfectly into the Brisbane Festival vibe. These guys prepare your food right in front of you, using liquid nitrogen. It’s like magic, but for ice cream. We are beyond obsessed with the lemon meringue pie flavour; it will seriously change your life. But, the list of flavours really doesn’t end there. There’s basil and strawberry, rhubarb crumble, coco jam vovo and so, so many more. They're also doing some flavours just for Brisbane Festival so keep an eye out for the s'mores coconut and the taco doughnut flavours. Luke Nguyen’s pride and joy, Fat Noodle, will be setting up shop in Arcardia during Brisbane Festival. Their fast, fresh hawker style street food will fit in perfectly amongst the hustle and bustle of Arcadia. 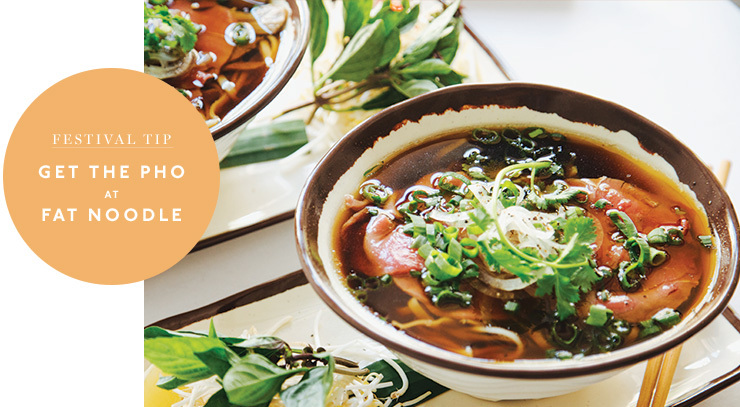 If you take one piece of advice from us, it’s this: get the pho! If you’re yet to try one of South Bank’s newest restaurants, Mucho Mexicano, then this is your chance. You’d be a fool to pass this one up really. With fresh, tasty and interactive eats, this is the perfect pit stop for those on the hunt for Mexican street food, designed to be shared. Sometimes you just need pizza. If there’s anyone that gets that, it’s the guys at Mister Pagnini. They’ll be on site dishing up oodles of calamari and freshly woodfired pizza. We’re so excited these guys will be there, because pizza is basically the best thing ever. The Snake Charmer’s Lounge will be home to more than just the usual Brisbane Festival fun, there’ll also be tapas. If there’s one thing we love more than drinking Vinaceous wine in an uber-cool lounge, it’s having accompanying tapas. Festival Flavours is the perfect pairing of a love of the arts with a love of delicious eats. During the festival, you can snap up a pretty epic meal (and matching drinks!) from these places all thanks to Brisbane Festival with a festival flavours voucher. Isn’t that the best? Check out the deals in full here. Plus, if you dine at any of the Festival Flavours restaurants you can simply fill out your details while you dine and be eligible for a trip to Singapore! Oh esq, you beautiful little gem, you. If you’re yet to experience esq, now is your chance. These guys are serving up gnocchi with minced bay shrimp and chicory perfectly paired with Little Creatures Pilsner. There’s also malt roasted Hawkesbury duck pancakes and cucumber matched with a glass of Vinaceous Red Right Hand Shiraz. This is going to be all kinds of delicious. 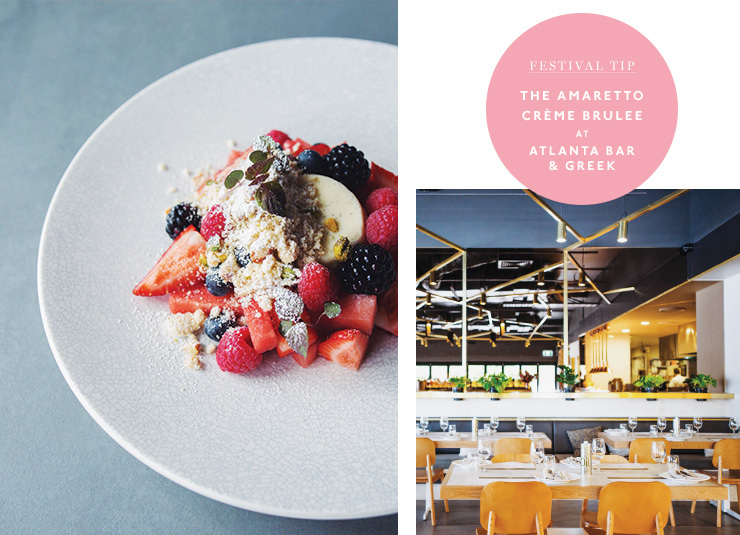 Aria is one of Brisbane’s finest dining institutions and they’re joining in on the fun of Festival Flavours. We’re not so secretly excited to try the roasted barramundi fillet with heirloom carrots, saffron, fennel and mussels which just so happens to match perfectly with the Vinaceous Sirenya Pinot Grigio. Blackbird Bar & Grill sits pretty on the banks of the Brisbane River, so it’s the perfect place to celebrate everything Brisbane, really. In honour of our fair city they’re giving you the chance to devour their 300g Darling Downs black angus scotch fillet served with mustard, coleslaw and matched perfectly with a glass of Vinaceous Salome Tempranillo Rose. Perfection. Atalanta Bar and Greek is one of our favourite places to chow down and engage in some hearty tipples and all of the Greek eats. These guys are serving up fig carpaccio, labne, apple cider vinegar with a hint of truffle and celery followed by slow cooked lamb leg with hummus, olives and rosemary plus Greek style slaw with a green apple and yogurt dressing. As if all that wasn’t enough, there’s even an Amaretto crème brulee. Oh, and it’s all paired with a glass of Vinaceous Voodoo Moon Malbec from the Margaret River. Customs House is kind of fancy, and now Brisbane Festival is finally giving you an occasion fancy enough to go! They’re serving up chargrilled rump cap steak, cauliflower and carrot puree with toasted almonds and pont neuf potato matched with a glass of Right Reverend V Cabernet Sauvignon. For a taste of gourmet Vietnamese without leaving Brisbane, The Foraging Quail is the answer. During Brisbane Festival you can sample the Bo Kho (a Vietnamese beef stew) with vegetables, wild rice and chili snow paired with a glass of Vinaceous Shiraz Grenache Tempranillo. This isn't the street food you're used to. Fat Noodle should be on every Brisbane foodie’s bucket list. You can try it during Brisbane Festival with an Asian banquet for two. It’s a good one too: edamame beans with chilli and sea salt, char sui pork belly with Asian greens, grilled half chicken with Asian curry marinade and a cabbage salad with coconut and dressing, duck fried rice and last but not least, sizzling calamari. Phew! That’s a lot of delicious food. Plus, it’s all matched with a Little Creatures Pale Ale. Inner city dining hot-spot, Vintaged Bar & Grill are joining in on the fun too with their roasted pork belly served with potato mash and apple mint sauced. It goes down a treat matched when perfectly with a glass of Vinaceous Shakre Chardonnay from the Margaret River in WA. Sounds like the perfect meal to us! Editor’s note: this article is proudly sponsored by Brisbane Festival and endorsed by The Urban List. For more information on our editorial policy click here.